Vanta developers create an intelligent network for real-time operation, which will enable users and companies to quickly develop their own services with the ability to transfer and process data in real time. The platform will also provide an opportunity to monetize their services at a low price, without using additional third-party infrastructure. As a result, user-created services will be integrated into the Vanta ecosystem and provided in the domestic market to anyone who wishes. An effective blockchain registry of the project will also be able to attract interested third-party projects so that they run their existing services in the Vanta ecosystem and are able to get more benefits and benefits from it. Using Vanta services will make a significant contribution to improving people's daily lives and business operations. The need to create this network is due to a fundamental reason, namely, the increasing amount of data transmitted in real time. These are the data that people and devices exchange. In addition to the number of devices connected to the Internet, the amount of data that people produce and consume in real time is growing rapidly. The need for a quick transfer of processing a huge amount of data is rapidly increasing. Examples include processes such as streaming high-definition video, group video calls, low-latency data processing for VR and AR services. In addition, the need for high-speed data transmission is found everywhere in such sectors as education, entertainment, individual health care and life support systems, information systems that track traffic, operational activities in the workplace. Increase network bandwidth. And thereby reducing the cost of network maintenance and transaction costs. Modern decentralized networks were not ready for a large number of users and transactions. Developers of already running networks are trying, on the fly, to figure out how to optimize performance and reduce the load on the blockchain registry. Problems of interaction with centralized services. Many companies are forced to use API protocols to interact with centralized services, in view of the expensive and time-consuming development of their own solutions. The problem of confidentiality of personal data. This is the most common problem now. No user can be completely sure that his personal data will not be stolen or sold by the owners of the services themselves, who accept this data from customers. In view of the fact that the blockchain technology sector is still quite young, there are no proven effective and reliable developments. And of course, the list of problem areas today is much broader. But the listed problems are priority for the development of effective protocols to solve them. Existing blockchain networks do not offer the functions necessary for the development of services. We are talking about similar services that offer platforms such as Slack, Facebook and Twitch. Such services should have the necessary functionality: text messaging, voice and/or video calls, streaming video transmission and data processing. Modern technologies for the implementation of distributed registries do not have the ability to interact with each other in real time. The development and use of such services, network technologies and infrastructure for the transmission and processing of data are important. Therefore, Vanta creates its own solution - a specialized blockchain platform for developing and managing network services that we can use in everyday life. Intellectual network Vanta. This is a blockchain registry that allows participating nodes to transfer and process data. The nodes will operate on the ARKAS protocol using a consensus algorithm within the network. Search for available connections. Nodes will consistently transmit information in encrypted form using a direct peer P2P connection with each other. Verified random function. This is a pseudo-random function that provides evidence that the information received by the node has not been altered and can be transmitted further over the network. The roles of network members. In the ecosystem there will be nodes with different types of roles. Since the exchange is carried out under the P2P protocol, this means that, by default, the nodes are not trusted and cannot trust each other. Therefore, to ensure the protection and resiliency of job processing, the system preselects a node with a specific role for data transfer. It is also worth noting that all nodes involved in ensuring the network's performance receive rewards for each new unit created in the proportion of labor expended to generate this unit. Work nodes that participate in the consensus on the Vanta network are responsible for completing tasks within the network, as well as for creating new units. It is possible to predict the benefits of launching the Vanta platform, given that real-time network technologies cover a wide range of areas where they are used. This technology can be used for messaging, data transmission in real time, making voice and video calls, streaming video of good quality, as well as for transmitting and processing data from IoT sensors. In addition to solving these problems using its own blockchain, the Vanta platform will provide and expand solutions for telecommunication networks at the level of enterprises and corporate clients. 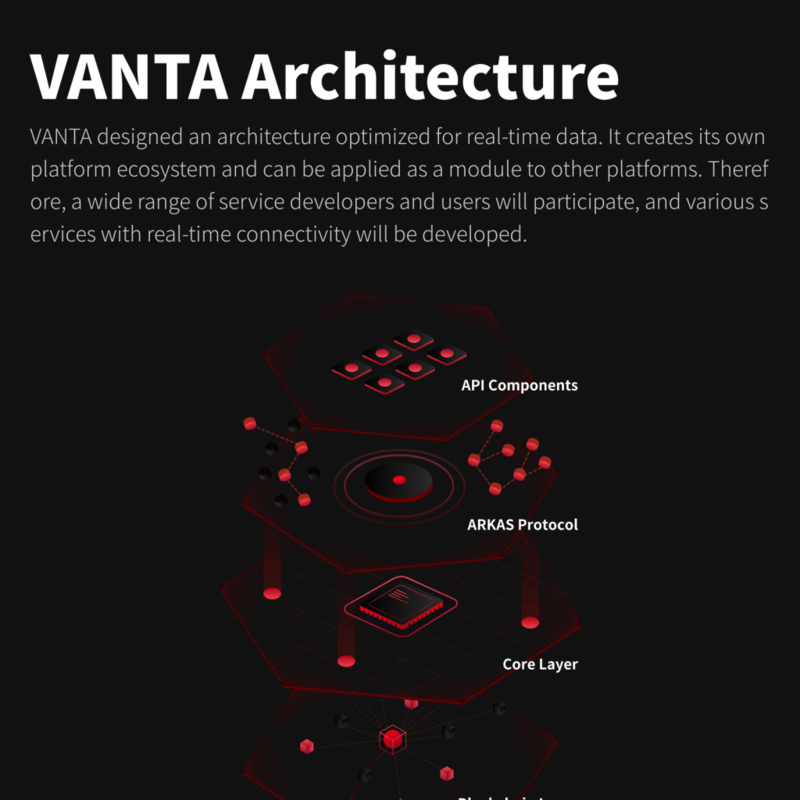 Using blockchain technology and a cryptoeconomic model for working within an ecosystem, Vanta creates a platform where participating sites transmit and process data in real time without having to turn to centralized systems and networks. Using Vanta will allow customers to get inexpensive and effective functionality for the implementation of both existing services and for developing future ideas.